They are all wonderful items. I would say the gc to Amazon. I think that it would help me purchase some exercise shoes and some books and other items I have been wanting. While I would love to have the treadmill, the Visa giftcard would be the most practical and helpful right now. I'm most excited to win the $250 Visa Gift Card because I could use it on anything I want! The Visa GC would be my favorite. I would use it to help pay the bills. Happy New Year Rosey... I have been swamped and wanted to get by and say hello. Hi Terry. We've been offline a lot too...visiting's fun though, and we don't get to do it too often. Happy New Year to you! Well, since I could use the Visa card almost anywhere, that is definitely my pick. The visa card is great. But I'd also love the treadmill. I would love to win the treadmill because it would be the perfect exercise for me. This is something that I could really use. I'm excited about the treadmill, it would help me keep up my cardio. I really want the treadmill! I'm slow, but stubborn! 'm currently training for a 15k. (My longest run so far has been 10k.) There are times I need to get in my run when it's too late (and therefore getting dark) or too hot. And I expect we WILL get rain again sometime. (Only 3.36 inches last year - new low.) So yes, I want the treadmill! The teadmill because I've always wanted one in my house and this will get me closer to my goal of getting 30 minutes of exercise in a day! treadmill because i'm tired of these cold temps! Obviously, the treadmill would be awesome, but either of the gift cards would be great too. I would love a treadmill! Just can't afford one at the moment. I would love the treadmill, because both my husband and I need to exercise more. I would love to win dollar 250 visa gift card !! I am very much excited !! $250 gc--because it would help with groceries. I'm most excited about the $250 gift card, because I can use it for whatever I want. I am excited about the $250 gift card, because I can use it on groceries. Definately the treadmill. I had mine for over 8 years. I would love a new one. I'm excited about the treadmill because I stay home and take care of my 90 year old granny. This would enable me to workout at home instead of going to a gym. I'd most like to win the $250 Visa Gift Card - I know where I'd spend it. The visa GC would be a good hit for our family. The treadmill, I need a place to run since we have a ton of snow & ice outside! I've been wanting a treadmill for a long time! The visa gift card, it would help out with groceries and things for the house! I would be so so so so soooooo excited to win the treadmill - but of course money is never a bad thing lol so I'd be happy to win one of those prizes too. The Visa Gift Card - it would cover 6 months at our local gym! I am most excited to win the treadmill, because I have been wanting and needing one for a while! i want the treadmill- i really wanna get working out back on track! I'd like a good treadmill because I am fat and running outside is just plain cold. 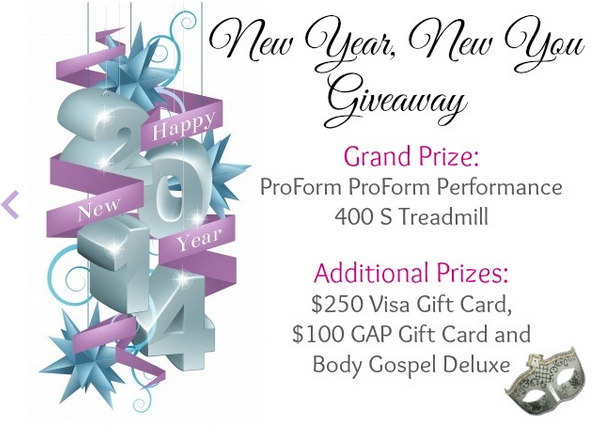 I would love to win the treadmill so my hubby and I can do workouts in the house instead of in the rain and/or cold. The Visa gift card--money is always nice, can be used for so many things! I'd like to win treadmill so i don't need to go to the gym anymore, thank you. Visa for my first grandbaby coming!! I'm excited for the GAP giftcard- new clothes! The treadmill so I can get back into shape. I would love the Treadmill due to health reasons, it could help me get my stamina back! I would love the treadmill. Its too cold to go outside for walks. The treadmill would be because I moved farther away from my gym and I would like to exercise from home a few days a week. I am excited about winning the $250 VISA gift card so I can buy some new clothes for the spring and summer. The treadmill! It rains often here and with that comes lightning. Not a fan of that, so working out on a treadmill will prevent me from the excuses. I am excited to win the Visa gift card. I need money for my medical bills and tests.